to fish, what species is your target. This week my client Rich Thompson from Minnesota told me he was bringing his son Ryan, and wanted Ryan to have a great day catching fish with his Dad. So that was the the goal for the day. We started seeing if the Snook were ready to end their winter fast. Okay, maybe you’re still on your diet. We fished a couple of other spots and caught some Snapper and Sheepshead. 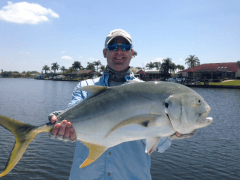 Then we found some Jack Crevalle. They were tearing the water up going for a free meal of their favorite food, live threadfin herring. 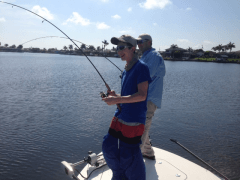 Throughout the bite, Ryan and Dad, had multiple double hookups and laughter broke out many times doing the “two step” trying to keep lines from tangling and not being the one that lost his fish. Ryan developed the “Ryan Technique” for catching fish by leaving the bait by the boat and watching the Jacks attack the bait boatside. 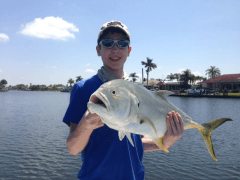 I had a great time with a great kid and his dad and look forward to next years spring break to have Ryan and his “Technique” back on board the “Egret” charter boat.